Posted on December 18, 2011 at 10:50 am in Hindi movies	| RSS feed You can skip to the end and leave a reply. LOL, memsaab! Seriously! I wish you would sub-title *every* screen cap you use with your comments. It made my day! And thanks for warning me off this film. This one is my favorite, although all of them are wonderful. This is mother of all product placements! Are all of those real products? I know the Limca is…but are they all? I do love this, love. I’m wondering whether they got paid for this ‘filmi’ publicity of their products. I wonder too :) Although they should have picked a much better film for it! Why, oh why, did I start reading this? I am sick, coughing and now I can’t laugh because it makes me cough even more, but if your review wasn’t enough to have me in splits, the song was even better! I have never heard this song before, and I am surprised, because such a song would definitely have caught my attention then, considering that I was at the right age then (now it is a different story!). Hats off to the lyricist who thought of making a song with commercials in it. How do you find these priceless gems? My pal PC at Third Floor Music has posted the soundtrack, by Ravi. What a waste of fantastic music, seriously. I put another favorite up there (the decanter has nothing to do with it) (well maybe a little to do with it) since it wasn’t available. Songs are great fun indeed, and Helen and Rajendranath are the CSP. But the story becomes totally insufferable! Argghhh. A Villain who’s a hero. The role of the brother-in law who pushed the sister and slapped the mother (both women) would fit him like a glove. Roopesh Kumar played the (other) villain, and he was MEAN. Poor Master Alankar. Poor Mumtaz. Poor Achala Sachdev. I was hinting at his ‘role’ in hitting Zeenat. I had seen this movie on TV and found it so-so. However the song – Main To Chala Jidhar Chale Rasta is my favourite which I can listen to any number of times. Your mini-review was hilarious. I must see the film. I know it will be nauseating, but Mumtaz and Master Alankar, not to be missed. They are quite wonderful, but horribly mistreated by both villain and “hero”…it is a very dumb and irritating story indeed, but watch the songs anyway! This is a wonderful idea to make screen cap comics! Love it! 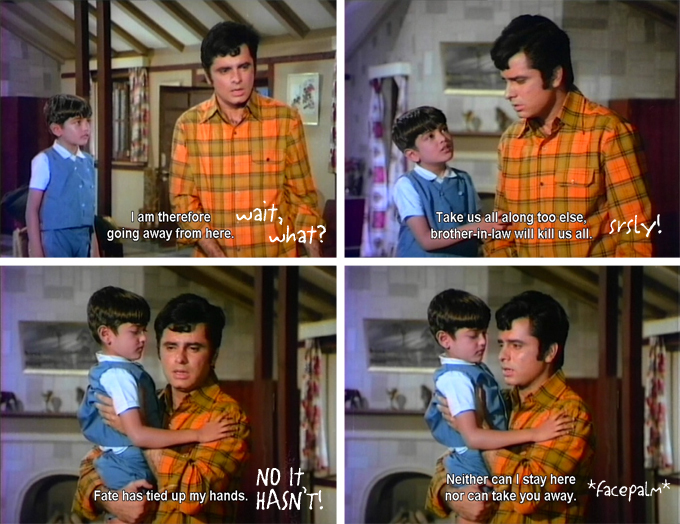 More of such filmi screen cap comics! I LOVED this. Your reviews are fantastic and always wonderful reads but this type of thing is also very good indeed. Already a fan of your comments on pics but this one took it up a new level. It’s always helpful when a movie writes its own review ;-) Glad you enjoyed it! Sanjay was handsome but this movie was bad. I remember watching this movie on DD, and it was probably the earliest reincarnation movie I saw. I liked it when i saw it for the first time although Im pretty sure I would hate it today. Don’t recall much of it now, but do remember something involving a tree, a bracelet and fake skeletons. I remember Jeetendra saying in one of his interviews that he didn’t get any movies during the Sanjay Khan era. He chose “Farz” (1967) not because it was one of the few good scripts, but that was the only movie that he was offered to him. Looks like Sanjay did have his good times in Bollywood. Especially when several of his movies in late 60s went on to be hits. “Dus Lakh” (1967), “Ek Phool Do Mali” , “Inteqaam” and “Shart” (all 1969) and finally “Mela” (1971) are a few examples. Not that I am a big fan of Sanjay, but……. Of course, that his well-known bad temper proved to be detrimental to him will only be an understatement. Thanks very much Salim :) Have a wonderful holiday wherever you are going! Great ‘mini-review’. This is one bizarre reincarnation drama. Why did I ever watch this? Roopesh Kumar gives me the creeps! I think he was supposed to :D But the reincarnation piece of it was just ridiculous. Not because it’s reincarnation, but because we’re supposed to believe a baby can become a 7- or 8-year-old in about six months. True. The mystery of the ‘super growing baby’! If I were asked to rate reviews this one would beat all the reviews hands down. I love your comment – with a hero like this who needs a villain– you see I just did not like Sanjay Khan so I avoided and continue to avoid watching his films. Yes, this is true of the film and true of the man himself I think! Isn’t this the film with the dream montage completely made of ad jingles, including Modern Bread among others? The last jingle in the montage was Nirodh, thus packing in a message on family planning! Yes it is, see the second comment above!!!!! :) I liked it so much I went to the trouble of finally figuring out how to upload things on Youtube! Best best best review I ever read, particularly of this film, Memsaab!